This is the type species of the genus. The type locality is off Messina, Italy. The type is thought to be at the Museum National d'Histoire Naturelle, Nice (Sweeney and Roper, 1998). We have recently examined two small squids from the Mediterranean Sea that do have the visceral photophore in contrast to the description given by Naef below. As a result, the identity of C. sicula remains uncertain as two species appear to be present in the Mediterranean Sea. with ocular but without (?) visceral photophores. with arm suckers in at least 4 series distally. with club suckers in more than 8 series. Arms I-III with 2 sucker series proximally becoming at least 4 series distally. Club without keel or protective membranes (Naef's large specimen was damaged, this character has questionable validity). Suckers of club in more than 8 series. Large photophore present on ventral surface of eye. Visceral photophore absent (see illustration below), or present*. Figure. Ventral view of the viscera of C. sicula, apparently the same specimen as in the title illustration, showing the absence of a visceral photophore and the presence of the accessory nidamental gland. Drawing modified from Naef, 1921/23b. A detailed description of this squid from the Mediterranean has not been published to our knowledge. The description of Pfeffer (1912) was based on squid of 13 mm ML and smaller. Joubin (1900) described a composite of three squid of about 50 mm ML taken from the stomach of a dolphin caught off Corsica. Unfortunately these specimens were in poor condition. Earlier descriptions lacked detail. Naef, 1921-23a, made the most detailed description of this species from squid captured off Naples. The description presented here is based on his account. *We have examined a specimen of C. sicula from the Mediterranean Sea that has the visceral photophore. There may be two species in the Mediterranean going by the name C. sicula; if so, we don't know which is the true C. sicula. More details of the description of C. sicula can be found here. Chtenopteryx fimbriatus Appellof, 1890, (from off Messina, Mediterranean Sea) Chtenopteryx cyprinoides Joubin, 1894 (from Corsican waters, Messina, Mediterranean Sea stomach of a dolphin) and Chtenopteryx neuroptera Jatta, 1896 (from off Napels, Mediterranean Sea) are considered synonyms of C. sicula by Pfeffer (1912). We accept this view until it can be established that more than one species of the genus is present in the Mediterranean Sea. Pfeffer (1912) established a new form (Chtenopteryx sicula forma chuni) based on a 7 mm ML squid described by Chun from the Indian Ocean. The distinction was based on developmental differences in fin length compared to Mediterranean specimens at similar sizes. There is some confusion in the literature over the proper spelling of the species name. The species was originally named as Sepioteuthis sicula but the ending was emended by Pfeffer (1912) to siculus when he placed the species in Chtenopteryx. Mike Sweeney checked into this and replies, "...I just had a conversation with Ted Bayer. Verany used sicula as an adjective for the Sepioteuthis of Sicily. Chtenopteryx is feminine and therefore requires the species ending as sicula (not siculus)." The paralarval stages are similar to those of other species of Chtenopteryx. Chromatophore differences, if present, have not been identified as yet. Figure. Left - Two very young paralarvae, ca. ...mm ML, side view. The circular tentacular clubs have about 20 suckers, irregularly arranged. Two chromatophores are present on each side of the mantle. Middle - A more advanced paralarva, ca ... mm ML, ventral, dorsal and side views. An equatorial circulet of 7 large yellow-brown chromatophores is present on the mantle. Posteriorly the expanded vanes of the gladius are visible in the dorsal view. Right - A even more advanced paralarva, ca. ... mm ML, ventral and dorsal views. Drawings and description of paralarvae paraphrased from Naef, 1921/23a. 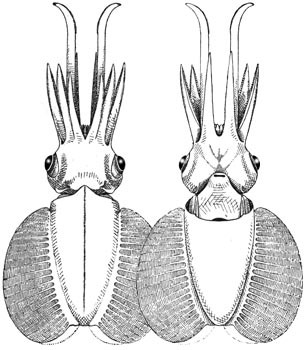 Species of Chtenopteryx are genenerally thought to be deep-living, pelagic squids some of which, at least, undergo twilight migrations to spend the night in near-surface waters (e.g. Young, 1978); data, however, are sparse. The image shows Chtenopteryx cf. sicula. swimming near the ocean floor at approximately 1300 m in the Mediterranean. Note not only the proximity to the ocean floor but the dramatic pigmentation pattern with (1) pigmentation of the fins restricted to its muscular bundles, (2) lateral pigmentation of the third arms and broad patches on arm II (?) and (3) a dark oval patch on the dorsal mantle above the digestive gland (left image). The right image was taken about 30 sec. after the first and chromatophores of the arms have been retracted. Figure. Chtenopteryx cf. sicula swimming near the ocean floor at about 1300 m. Note the unusual pigmentation pattern on the mantle, fins and arms in the left photograph and the absence of the pigmentation on the arms the right photograph. Photographs were taken from an ROV from the R/V NAUTILUS in the Mediterranean south of Turkey. © Ocean Exploration Trust. Due to our poor understanding of the species-level systematics in this genus, the presence of Chtenopteryx sicula outside of the Mediterranean Sea is uncertain. Appellof, A. 1890. Teuthologische Beitrage. I. Chtenopteryx n.g., Veranya sicula Krohn. Calliteuthis Verrill. Bergens Museums Aarsberetning. 1889(33):1-34. Jatta, G. 1896. I Cefalopodi viventi nei Golfo di Napoli (Sistematica). Fauna und Flora des Golfes von Neapel. 23: 268 pp. Joubin, L. 1894. Note p;reliminaire sur les Cephalopodes provenents des campagnes du Yacht, L'Hirondelle. Memoires de la Societe Zoologique de France, 7: 211-216. Joubin, L. 1900. Cephalopodes provenant des campagnes de la Princesse-Alice (1891-1897). Resultats des Campagnes Scientifiques accomplies sur son yacht par Albert Ier Prince Souverain de Monaco. 17:1-135. Naef, A. 1921-23a. Cephalopoda. Fauna und Flora des Golfes von Neapel. Monograph, no. 35. English translation: A. Mercado (1972). Israel Program for Scientific Translations Ltd., Jerusalem, Israel. 863pp., IPST Cat. No. 5110/1,2. Naef, A. 1921-23b. Cephalopoda. Fauna e Flora de Golfo di Napoli. Monograph, no. 35, 863 pp. modified from Naef, A. 1921-23b. Cephalopoda. Fauna e Flora de Golfo di Napoli. Monograph, no. 35, 863 pp. Page: Tree of Life Chtenopteryx sicula (Verany 1851). Authored by Richard E. Young and Michael Vecchione. The TEXT of this page is licensed under the Creative Commons Attribution-NonCommercial License - Version 3.0. Note that images and other media featured on this page are each governed by their own license, and they may or may not be available for reuse. Click on an image or a media link to access the media data window, which provides the relevant licensing information. For the general terms and conditions of ToL material reuse and redistribution, please see the Tree of Life Copyright Policies.